Have you ever Googled yourself and found your name and contact info listed publicly online? This is a common phenomenon, and it’s happening to more of us every day. 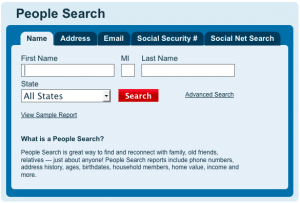 A few weeks ago, we ranked the best and worst of people search websites: places like Spokeo.com, Intelius.com, and WhitePages.com that collect and post your personal information for anyone to see and search. You can get your listings removed, but it’s quite a hassle. These sites get your info through public documents and records, such as those created when purchasing a house, getting married, filing for divorce, filling out a survey, obtaining a driver’s license, getting arrested, establishing a social networking profile, or voting. There’s some debate over whether this practice should be legal, and lawsuits are currently pending on the issue. We scored Intelius the lowest because of its complicated opt-out process. We recently spoke with Intelius’s Chief Privacy Officer, Jim Adler, about deleting your info, and we’re happy to report several privacy-friendly updates. A bit of background: you opt yourself out by faxing a copy of your ID and all the information you want removed, such as alternate spellings of your name, past addresses, etc., to Intelius at (425) 974-6242. Intelius and several other people search websites, such as ZabaSearch.com, PeopleLookUp.com, and Phonesbook.com, all use the same fax number to opt out, which raised our eyebrows. Second, if you find your info listed on several of Intelius’s partner sites, you can send one opt-out fax listing all of the sites from which you want to remove yourself. Hooray for spending less time in front of the fax machine! Jim also told us that Intelius plans to streamline the opt-out process in coming months. Details are yet to come, and you’ll still need to provide your ID for security reasons, but it’ll be simpler. We’ll keep you posted on the details. 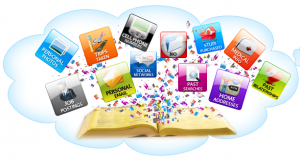 If you’d prefer to have our experts to delete you from online databases, our DeleteMe service can help you accomplish it. 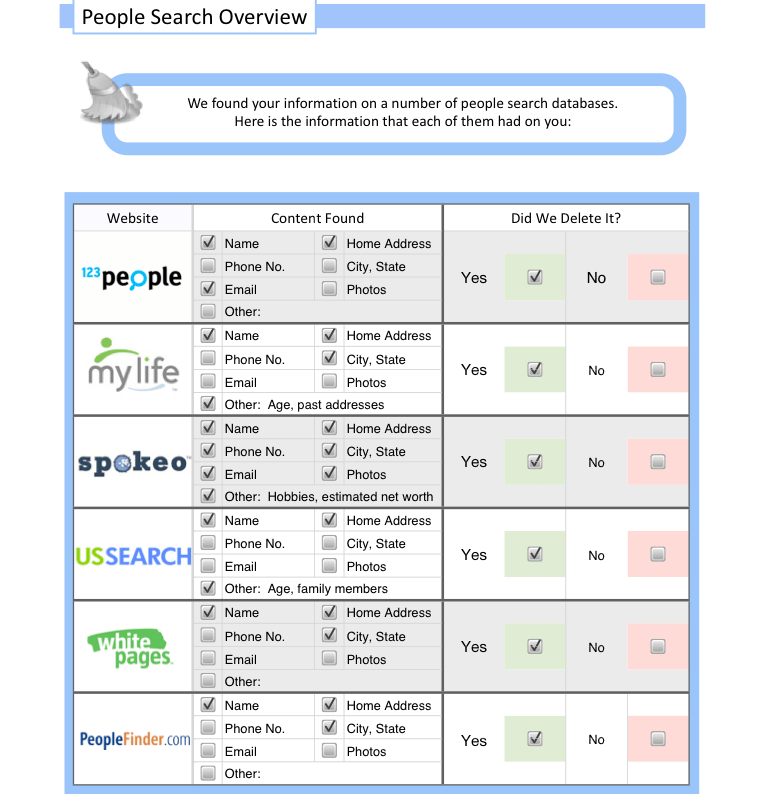 A year-long subscription to our DeleteMe service for $99 (1) finds your information on people search websites that publicly list it; (2) shows you images of what we found about you and where in an email report; and (3) removes your personal information from a list of the largest people search websites, including Intelius, WhitePages, and Spokeo. You can see the full list of sites we remove you from here. We’ll then monitor the web for your name throughout the year and remove it when we find it, providing you with four reports on the status of your online identity (one every 3 months). You can check out the DeleteMe subscription page for more info. We use a combination of phone, fax, mail, and online opt-out procedures to remove your information from the largest people search databases. These large databases are the source for almost all other personal information on the web. In short, if we remove your info from the large databases, we cut them off from supplying it to the rest of the sites. But what if my information comes back? Wouldn’t it be nice if all your personal info wasn’t publicly available online for anyone to see? Your listings won’t reappear on the sites we opted you out of unless you resupply them with your information, whether intentionally or accidentally. As a general rule of thumb, though, be careful about who you supply your contact information to. You’d be surprised how often your information is collected: for example, when you order something online, sign up for a social networking site, send in a rebate, register a product, or enter a sweepstakes. We recommend using Abine’s PrivacySuite and ChromeBlock software to protect your information when you’re browsing the web. I don’t have a website. Am a simple widow who somehow got onto this nasty site. Am trying to get out of it, but at 69, most is over my head. Somehow found this site. Hopefully something will result in the near future. Thank you. If you’d like us to take care of it for you, just let us know! Are you guys able to remove people from http://www.namesdatabase.com? This is extortion !! Your the internet mob!! I am getting mail addressed to a distant family member and my Company as if she is associated with my Company. How do I find out what database is giving out the wrong info to advertisers and how do I get her name off that database?